I am sure I must have overlooked this. But I searched high and low. Does it exist? Thanks @Victor. My abilities with AppleScript are quite limited, but I am not a complete beginner. Time is more of an issue. Perhaps I’ll just wait for @jessegrosjean to get around to it, if it is in the roadmap. 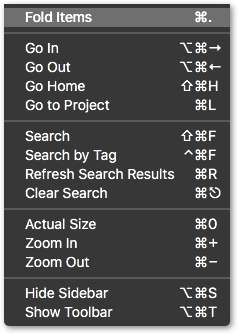 You can do this, I think, with ⌘A ⌘. Does that match what you are after ? Hi Thanks @complexpoint. What I am looking for is a way to toggle unfolding/enfolding all the projects on a page at once, so I see only the projects with their dots. This command only seems to do unfold/enfold the selected project?. Note you can do this by doing Select All and then toggling folding. Thanks @complexpoint. That search works great. The disadvantage of that being I have to create that list item in all of my different documents. OK that’s no big deal. I should stop whinging and be happy. The more I use TaskPaper the more I like it! Something like a TextExpander or Keyboard Maestro shortcut ? Yeah I guess. Or maybe @jessegrosjean could be persuaded to include a ‘Collapse all projects in document’ menu item/shortcut? I mean, it looks pretty! I’m not sure. One one hand it’s of course easy to add. On the other hand if I add all the different expand/collapse enumerations that are possible that view menu starts getting really big. At the moment I just can’t decide and so I’m leaving them out until I’m sure I want them in. Of course it would not make sense to list all the different enumerations in the View menu (or should it be in the Items menu? ), but my argument in favour of adding “Collapse All” would be: It is so neat and satisfying to see just a list of all your project items. Suddenly your tasks don’t look so complex! Suddenly your tasks don’t look so complex! Checking which searches a document already has, and only adding the missing ones. // Any search menu items not found in this document ? that works perfectly. thanks @jessegrosjean! Thanks @complexpoint. Scripting genius!! I can see this could easily be tweaked to be useful for a range of different scenarios. Hard to tell exactly when the Rube Goldberg / Heath Robinson line has been crossed, but it would also be possible to save the saved searches of one document, (e.g. as a small JSON file) and load them into another, or choose a selection of them from a menu. I need to know where that line is - and fast. 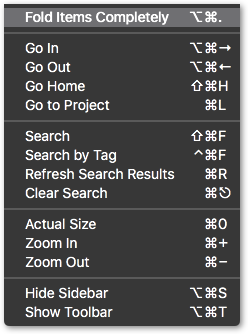 A TextExpander solution works well here, I think – two or three chars which are instantly replaced by a group of your preferred searches, when you start a new TaskPaper 3 document, or want to add searches to an existing one.